Also Tassel is introduced in this episode (at least she and her squirrel-friends will help Watership Down in the third season). Generally, her tree adds a nice location to the series. The problem, I have with this episode: It's right before the season-finale. On DVD, we have the piece of luck, that this episode is placed within the third season. But seeing it in order of the series, it's simply prolonging the season. In this episode Bigwig's critique of Redstone's state of security is so intense, that Hickory becomes visibly irritated and Hazel has to step in before Bigwig delivers more of it. I can understand how somebody would get annoyed with that, but Bigwig says those things for good reason. It's like Hawkbit says: "There is a good way, there is a bad way and there is Bigwig's way." I wonder if this is what made Hickory think he wasn't a good Chief Rabbit and that's why he gave that position to Woundwort in third season? I don't think, that Bigwig affected Hickory's decision to commit the leadership to Woundwort. He seems to be very annoyed of Bigwig's criticism. Hickory thought, Woundwort was the savior of Redstone. The warren struggled with Elil, humans and food shortage. Woundwort killed the Elil, repulsed the hunter (with a bit human help ) and solved the food problem. That's, why Hickory commited the leadership. "Weedstalk is helping me to become Chief Rabbit I always wanted to be." That sounds to me like Hickory believes himself to be an inadequate leader. This belief could be the result of recent problems and slightly less recent comments made by Bigwig about the state of Redstone security. He tries to learn from Weedstalk and become more competent Chief, but ultimately he decides that Redstone needs someone who already knows how to lead and not Chief-in-training. Well... Either way we all know who we're talking about. Yes, and now we know, why Spartina said "We don't speak your name", when she met him. Are you saying she took him to Darkhaven, because she though he might be the Dark One (since Campion had lost one eye, he kind of fit the description)? 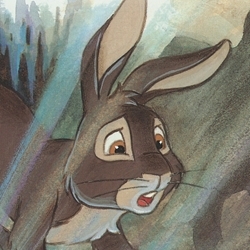 Didn't Spartina call Woundwort "The One-Eyed Warrior"? So she might have confused him with Campion. Indeed that is how it is spelled. Well I'd hope not, you're a bat. Maybe you can bust through some hi-fi nonsense I walk through on some hi-end forums. *goes to find his old copies of Silverwing* Been a while since I read those ones. TV series didn't measure up to the books.